How long does friendship last? Can it survive a separation of 50 years? When two women meet in a TV studio for the first time in half a century they re-live the horrifying events that brought them together in the first place – and face the awful truth of why they had stayed apart until this moment. John Misto's play is a powerful tribute to the thousands of allied women who suffered at the hands of the Japanese during WW II, yet whose fate went largely unnoticed in what was generally perceived as a "man's war". It also serves to remind us that the suffering has not stopped, and that "Man's inhumanity to Man" knows no bounds. What shines through in this case is the strength of the human spirit and the lasting closeness that shared adversity can bring. Joan Nordlund is a lecturer in English at Helsinki University Language Centre, and was a member of the team that developed Autonomous Learning Modules in the mid-1990s. The focus of the teaching is on learning and studying strategies. Students consider their individual needs and build on their strengths. Joan applies the principles of autonomous learning in her teaching, and in her approach to directing. Joan comes from near Sheffield, from the coalmining district of the English North Midlands. Her marriage brought her to Finland in 1980. She has not thought about whether she would go back to England. "Finland is where I live. My home is here. But I enjoy our annual visits to the UK." She misses England most in March and April, when it is spring there while in Finland we are still sloshing around in the melting snow. The theatre is Joan's hobby. She joined the local church drama club as a young teenager, and her first job was to rattle the thunder-sheet backstage. She was active in drama and musical groups at school and university. Wigan Little Theatre near Liverpool and Kensington Drama Club in London were tough training grounds. As a stage manager she gained first-hand knowledge of the mechanics and practical details involved in mounting a production - which anyone who wishes to branch out into the creative world of direction should have under their belt. She joined the revived Finn-Brit Players amateur drama group in the 1980s. Among other things she has directed works by British playwrights including Brian Clark, Alan Ayckbourne and Harold Pinter. This autumn Joan is directing John Misto's "The Shoe-Horn Sonata" with The Really Small Theatre Company. The play is about the harsh experiences of Australian and British women landing in Japanese prison camps in the Second World War. It deals with the moral dilemma of whether it is more important to save your friend's life or to preserve your own honour. "The message of this powerful text comes through without pointing the finger at anyone. The play is deeply emotional, but avoids melodrama. There's also some humour in it." Asked what she likes about the theatre Joan replied, "There's nothing like the sound of audience laughter and applause." On February 24, 2005, while visiting Sydney, Australia for work (I'm actually an astronomer, but don't hold that against me) my hosts took me to the Glen Street Theatre in Frenchs Forest to see a play about which they had read many rave reviews and heard many glowing praises. Knowing my passion for and involvement in theater they were eager to treat me to a night at the theater. Long after the play had ended and we had arrived back home and had a nightcap overlooking the ocean in the soft, warm Sydney air and dissected our feelings and impressions of the play, the echoes of the actors' voices haunted me throughout that night and the rest of my stay. 'This' was the play The Shoe-Horn Sonata by Australian playwright John Misto, for which he won the 1995 Australia Remembers National Play Competition and the 1996 Play Award, NSW Premier's Literary Awards. The Shoe-Horn Sonata tells the story of two women – an Australian nurse and an English civilian – who met in the waters outside of Singapore after their ships were sunk during World War II. They were amongst survivors who were captured and taken to Japanese war camps in Malaya. The play goes back-and-forth between reminiscences of their time in war camp to the present where the two women have met after some fifty years at the behest of a documentary maker. The women's stories range from clinical re-tellings of some of the brutalities they suffered, to more light-hearted memories of camaraderie and shared survival skills, to disclosures of painful personal sacrifices. The one thing that kept them going during those dark days was music, specifically the songs sung by the choir that they and other prisoners formed. And the one thing that kept the choir going was the shoe-horn that had been given to the young Australian army nurse by her father. That shoe-horn was used to keep time while the choir, composed of so many frightened young women, sang those songs that kept their spirits up during those days, months, and years in war camp. That night – the night Angie, Joan, and I got together to read The Shoe-Horn Sonata – The Really Small Theatre Company – was conceived. We wanted a platform from which to launch The Shoe-Horn Sonata project and within days we had the commitment of so many people who were willing to help us in this endeavor, including Jonathan Hutchings who lent his distinctive voice to 'Rick', Joe White and Barry White (no relation!) who generously let loose their talents in sound and light design, and many others. John Misto himself provided us with the slides for the backdrop and general encouragement throughout our rehearsal period. We began to rehearse later that summer, in the wonderful space of the Nordlunds' office. 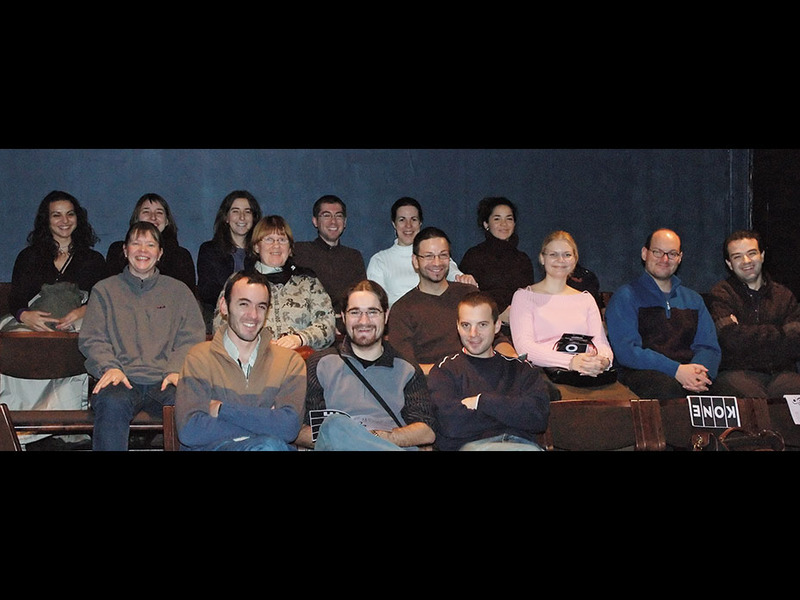 Finally, on December 4, 2005, The Really Small Theatre Company debuted at Teatteri Jurkka with the first-ever performance of The Shoe-Horn Sonata. We had another four performances, and we'll never forget the kindness, generosity, and support of the Jurkka staff. After that, The Really Small Theatre Company took off with a life of its own thanks very much to the drive and determination of Joan Nordlund, and the support of so many. Still today, nearly ten years on from the first time I sat in the audience in Frenchs Forest, I get goose-bumps at the power of the play, and I am so grateful of the forces that came together to bring this play onto the stage. Thank you, The Really Small Theatre Company, for the joy, the tears, the laughter, the memories. I miss you.